In the beginning, the Astrodome was a wonder, the epitome of the burgeoning feeling—since dissipated—that humankind, now exploring the stars, was on the brink of mastering the universe. The stadium was also a marvel in itself, a wholly contained world, climate-controlled, the dominion of the gods finally wrested into human hands. The players who called it home didn’t at first add much to the wonder, though things started to change with the introduction of the blazing rainbow-colored uniforms in the mid-1970s. A sign that the Astrodome and the Astros were approaching equal terms as symbols of wonder came in the 1977 film The Bad News Bears in Breaking Training (more on this cinematic artifact in a bit), when the quest-like awe the film’s titular little leaguers hold throughout for the mere idea of the Astrodome is equaled in intensity and enthusiasm by their reaction to the entrance into the action of some members of the Astros. In real life, the Astros were still a couple years away at the time of the film from escaping their mostly unbroken history of mediocrity, but in 1979 they finally burst into full rainbow bloom by entirely embracing—by loving—their home. It’s not an accident that the team photo shown in this 1979 card is the most relaxed-looking team photo I’ve ever seen. The Astros are lounging around outside the Astrodome like brothers and cousins at a family reunion. Though the photo was likely taken in 1978, it telegraphs the fate of the team in 1979, when they would begin a three-year span as one of the elite teams in the National League by completely merging their identity with that of their home. The Astros and the Astrodome became one. The late Astros of 1979–1981 are one of my favorite teams in baseball history, a rainbow cyclone of slap-hitting, power-pitching, and speed. The equation never worked very well on the road, where the Astros compiled decidedly mediocre records during this golden age of 37–44, 38–44, and (in the strike-shortened 1981 season) 30–29, but in the Astrodome they dominated like a John McGraw deadball-era fever dream, going 52–29, 55–26, and 31–20. No one on the team could hit for power, but virtually everyone could fly, and so a walk became a walk and a steal, a double became a triple, and the winning run on third became a rainbow torpedo blazing for home as the batter squared for the suicide squeeze. So when I look at this 1979 team card I see a team that loves its home. When I typed that sentence in a Word document, a squiggly line appeared under the word “loves” and the suggested correction—apparently connected by the ham-fisted artificial intelligence of the automatic spell-check to the word “team”—was “loses.” But then again, that correction would make for a true sentence, too, eventually, as the Astros moved out of the Astrodome, losing their home. They still have a ballpark where they play their home games, some structure that used to be named for one corporation and is now named for another, but how can it compare to the Astrodome, which was in name and in spirit an extension of the team? 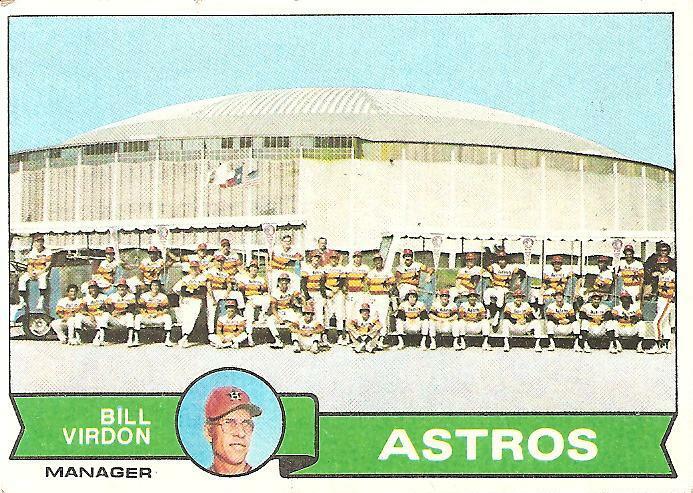 Or was the team an extension of the Astrodome? Really, the borders between the Astros and the Astrodome were like the borders between colors in a rainbow, and any attempt to detach one side of the border from the other would make the rainbow dissolve into something meaningless, gray. My book on The Bad News Bears in Breaking Training (part of Soft Skull’s Deep Focus series) will be out on June 7. Meanwhile, I’m getting ready to do some reading and drinking as part of some events planned by the publisher of the paperback version of Cardboard Gods. The Naperville Sun has an article on the first stop of the “Free Beer Tour”; for info on the other stops, please see my book events page. Back in my old home state, Dan Bolles has a nice article in Seven Days on me and the writing of Cardboard Gods. Seriously, we should all go out of our ways to still call it that. On the one hand, who wouldn’t want to pay tribute to un-checked corporate avarice run-amuck, and the disgraceful spectacle of greedy billionaire CEO’s feasting off the pensions and dreams of subordinates…. And on the other hand, a matching disgrace is the way a pop-fly can go for a four-bagger there. Typical turn-of-the-millenium band-box, custom made for the Age of ‘Roids… and filled with so many hackneyed “little unique touches” that the end result is a stadium devoid of any true character. Even though I’m no fan of the “domed stadium,” (or even the “retractable roof” for that matter), the mighty Astrodome was just unique enough, just gaudy enough, just self-mythologized enough to give it a certain period-appropriate charm, and I was sad to see it go. Incidentally, I know a couple of guys died young, but doesn’t NINE retired uniform numbers seem like an awful lot for a consistently mediocre franchise that has never won a championship? Aah…, maybe I’m just bitter that the Astros have thrown Ten no-hitters….grumblegrumble…. Brewster Mcloud (Robert ALtman director) also had some scenes filmed there in 1970. Brewster McCloud indeed, in which the Astrodome itself limits the flight of Icarus, or something like that! The Astros gave the 1980 Phillies their most-exciting playoff series challenge – all those .285 line-drive hitters were fun to watch. And how cool was Enos Cabell, just everything about the guy? Josh, I am heartbroken reading about the 1980 Astros. My Dodgers, who were 3 behind with 3 to go that season, played one of the most thrilling series of games I can recall. All three games were broadcast on local television live by KTTV Channel 11, which back then was unusual for over-the air television stations. After sweeping the series, the Dodgers and the Astros prepared to play tie-breaking game #163. And then, Tommy Lasorda decided to start Dave Goltz. Game over before it started; Astros won 7 – 1. It’s been 31 years, and I still remember that weekend like it was yesterday. Here’s a great trivia question: Who lead the 93 win 1980 Astros in home runs? It was indeed the immortal Terry Puhl with a whopping 13 dingers. He hit 4 of them at home, which tied for the team lead at home with Jose Cruz. That epic LCS vs. the Phillies still stands tall as (IMO) the best LCS of all time. We knew the correct pronunciation, but my friends and I all liked making the “h” in Terry Puhl’s name non-silent. We called him Terry Pu-hool. Josh, I have been distracted by activities largely beneath me, but not all of them have been for naught. Regardless, I see that I’ve missed several important plot points here. 1) My sincere congratulations to you and your lovely wife on the pending addition to your family. As per the Amazon description of your BNB:IBT title, I strongly encourage you both to be unreasonably optimistic and embrace all the possibilities that parenting will bring. Your future child(ren) is very lucky, indeed; let them play. 2) To celebrate the recent long weekend in a manner not acknowledging Uncle Sam, I watched GRAND PRIX yesterday. For no particular reason, I also watched BREWSTER MCCLOUD. According to its no doubt authoritative Wikipedia entry, the latter is the first movie to be shot inside the Astrodome. Ah, but was it the best movie shot inside the Astrodome…? Better perhaps than MURDER AT THE WORLD SERIES, yes. There is the little matter of that star turn taken by Jimmy Baio and Enos Cabell, though, a film you are very familiar with. Truly there is no place like home, the Astros have seemed quite lost in a number of ways since being evicted from their dome sweet Dome. I still recall going to class the afternoon of 15 October 1986 with Game 6 of the NLCS underway and returning, some time later, to find it was still going. In that alternate universe where Mike Scott starts Game 7, so too does JR Richard have a little left in his tank to have closed out Game 6 in favor of Houston and Cesar Cedeno finished his career with a championship ring. Perhaps in a nearby alternative universe, Game 6 never ended. In our reality, however, things begin and things end and we learn to savor those flashes and all the flavors in-between. What is is so much sweeter than what could have been. I live now in a state that rightfully hails the rainbow as a quality of life, and each one I see taps into the power that the Breaking Training-era Astros, for a moment, mainlined. The Bears, well, there is no stopping a team with peak-level Kelly Leak. Distracting, yes, sometimes, but stopping? Never. Thanks for the congrats, LSfP, and thanks for the great thoughts on the rainbow mainlined. I finished reading your latest this weekend, happily coinciding with a Father’s Day screening of BNB:IBT last night. Perhaps yesterday was your first Father’s Day…? I will not step on either denouement until you properly update us, but I am much obliged for the treat of seeing that movie through your 10yo eyes. Truly you were at that moment the intended audience, and I relished being transported there and back again. Also, the Deep Focus book felt like you were putting out the good place settings, in a way that the Cardboard Gods monograph could not or ought not. Reading it (and then watching the movie) was a delightful culmination of lo these many months of following your blog. Plus, a shout out to Skip Jutze? Brilliant. Know that I am now committed to sending all my forthcoming email in the voice of Tanner’s postcard correspondence with the Looper. Thanks for these many pleasures, Josh, and the pleasures yet to come. Well done, sir. Thanks very much for the good words on the Breaking Training book. I know that’s a movie that means something to you, too, so it means a lot that you dug the book. Speaking of the 1980 Astros, did you know that the pitching staff that year combined for 3 home runs, which is as many as or more than 3 of the Astros regular position players? Ashby and Pujols had 3 combined at catcher, Reynolds had 3 at shortstop and Cabell at third base had only 2 all year!